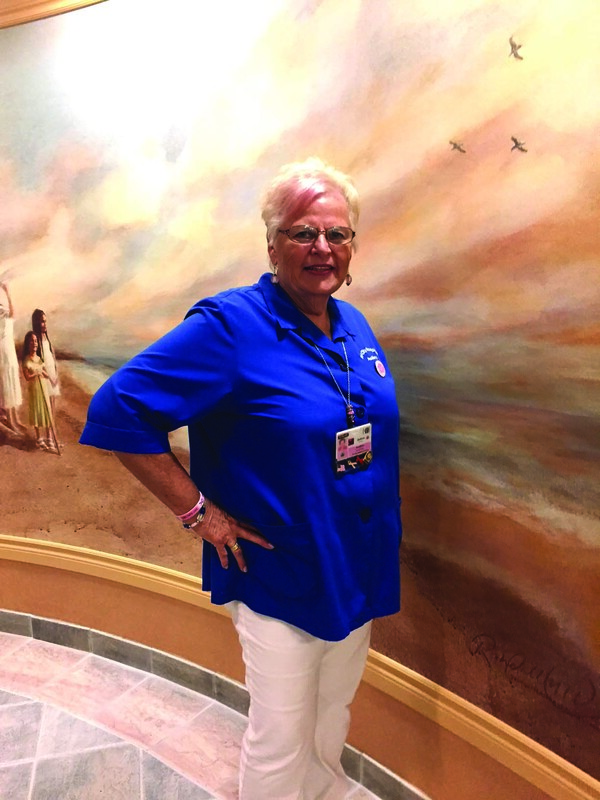 VISTA — Inside the entry doors of Tri-City Medical Center in Oceanside, auxiliary volunteer JoAnn Horton greets every person coming and going. This month, the pink streak in her silver hair reminds people it’s Breast Cancer Awareness Month. Horton is a two-time breast cancer survivor. Both times she received her diagnosis and comprehensive care at Tri-City Medical Center. Her first breast tumor was detected in a mammogram in 1997. Following a lumpectomy, Horton was on a course of Tamoxifen therapy for five years. Being proactive, Horton followed her doctor’s orders and underwent her regular mammograms. Nearly 20 years after her first breast cancer, another tumor was found in the other breast. After a lumpectomy on Dec. 28, 2016, her medical team decided on a 25-day treatment of radiation and a five-year course of the oral cancer-suppressing drug named Letrozole. Each time, it was the radiologists at Tri-City who spotted her breast lesions. Horton cannot stress enough the importance of a mammogram. Each of her breast cancers was detected early — and with cancer, early detection can mean everything. On Nov. 18, the Tri-City Hospital Foundation is hosting its 37th annual Diamond Ball Fundraiser. Entertaining guests will be iconic comedian Dana Carvey. Horton’s radiologist, Dr. Jennifer Mayberry, is co-chairing the gala and she notes that proceeds will go toward procuring new cutting-edge digital breast imaging technology at Tri-City Medical Center. Advanced technology will help detect cancer in its early stages. Everyone is excited about this, including Horton. Since Horton did have a breast cancer reoccurrence, she underwent a BRCA test at Tri-City Medical Center. It was important that she did this because she has two daughters and four granddaughters, she said. Horton tested negative. As of June 2017, Horton is cancer-free. Tri-City Medical Center offers a complimentary cancer navigator for those diagnosed with breast cancer. The navigator is a nurse who is by a patient’s side through the whole journey to provide medical answers and moral support when needed. This branch of care is 100 percent donor funded. As for Horton, she can’t imagine going to any other hospital than Tri-City. Since moving to Carlsbad 50 years ago, Horton has always relied on Tri-City to take care of her entire family’s health and wellness needs. It’s the personal connection she feels at Tri-City which has compelled her to pay it forward and be one of 400 auxiliary volunteers for the past five years. Horton is sensitive to the fact that some women are too afraid to get mammograms. She doesn’t want them to feel this way. When she has the chance, she said she reminds others that her cancers were detected at Stage 1. For more information on Tri-City Medical Center breast health, visit https://www.tricitymed.org/medical-services/womens-health/mammograms/. Those interested in attending the 37th annual Diamond Ball Fundraiser on Nov. 18, can visit www.tricityhospitalfoundation.org.